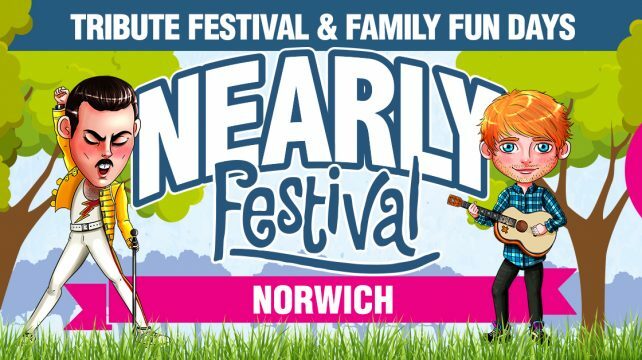 We are very Excited to announce our very first 2-Day Festival in The Fine City of Norwich! The Regions No.1 family friendly tribute Festival. Expect a fun filled weekend with 14 of the UK’s best tribute acts fully Live on stage with a Tasty ‘Street Food Market’, Pub priced ‘Pub in the Park’ & Funky ‘Kidzone’. Supporting & Showcasing local Norfolk businesses, vendors, charities & organisations ..
We ( The NEARLY FESTIVAL ) have enjoyed hosting fantastic Garden Parties across Norwich & Norfolk over the last three years & these will continue but in addition to our other Prestigious 2-Day Festival locations such as Abbey Gardens in Bury St Edmunds & Castle Park in Colchester we are adding one more prestigious location in the City where it all began for us back in 2014 .. The fine City of NORWICH ! Saturday, Sunday or Weekend Tickets available! Support our Charity Partner, purchase a £2.50 donation ticket today with your order. The full £2.50 per ticket will passed onto them. Sunday - Early Bird £15 Tickets are sold out. Sunday - Standard £17.50 Tickets are sold out. Sunday - Teen/Student (Full Time ID) £10 Tickets are sold out. Sunday - Kids (5-15) £5 Tickets are sold out. Please make sure you have ID with you if your lucky enough to look younger than 25. Challenge 25 in place. © 2017 East Anglian Events.